Two websites have been developed that contain a wealth of information on El Niño and preparing for potential flooding during winter storms. •“El Niño and Flooding Resources,” UC ANR California Institute of Water Resources website http://ciwr.ucanr.edu/El_Nino_-_flooding_resources/ contains a wide range of materials related to storm preparedness. It also includes contact information and media coverage for UC experts on El Niño impacts, forecasting and models. California’s academic institutions serve as a tremendous resource in offering everything from near-term manage-ment advice to farmers and ranchers as well as the innovative work being carried out by researchers. •“California Storm Ready” (www.storms.ca.gov) is our state government’s central web portal for information about how to prepare for potential winter storms. This includes updates of weather conditions and an overview of preparedness for winter storms on the State’s Winter Readiness Fact Sheet. Also included are current news stories related to El Niño and videos with tips on how to prepare for flooding. On November 2, the Governor’s Office, the Governor’s Office of Emergency Services and the Natural Resources Agency conducted high level briefings with federal, state and local representatives on impacts and threats to the state from potential winter storms. Information on the website describes the extra care the state is undergoing to prepare for potential floods due to El Niño winter storms and the attendant sea level rise. Climatologists’ predictions for 2016 indicate the potential for strong El Niño-related precipitation and flooding, particularly in southern California. Forecasts also indicate that temperatures throughout the state may remain high, complicating the precipitation picture, particularly for the agricultural sector (California Institute of Water Resources). These predictions are based on the El Niño-Southern Oscillation (ENSO), a climate phenomenon that can provide some predictive guidance in parts of the United States under certain conditions. ENSO is characterized by year-to-year fluctuations in sea surface temperatures along the equator in the Pacific Ocean between Peru and the International Date Line, and concomitant fluctuations in sea level air pressures between Tahiti and Darwin, Australia.  The ENSO cycle is expressed as three states: neutral conditions, El Niño (warm ocean phase), and La Niña (cold ocean phase) (Western Regional Climate Center 2015). In March 2014, climatologists predicted an El Niño event when observations pointed to a developing warm sea surface temperature (SST) anomaly in the eastern tropical Pacific. The development did not pan out into a full blown El Niño event and Water Year 2015 added another year to the ongoing California drought. Unfortunately, making seasonal forecasts of precipitation is scientifically difficult, and the accuracy of such predictions is much less than that of a seven-day weather forecast (Western Regional Climate Center 2015). So why are we continuing to receive warnings to brace for a potentially wet winter in 2016? Why is it important for California nursery growers to implement flood prevention measures when the reality is we could end up looking at yet another year of drought? We asked Michael Anderson, State Climatologist for the California Department of Water Resources, to explain the basis of the predictions for strong El Niño-related precipitation in 2016. When attempting to make seasonal climate forecasts in developing these forecasts, scientists consider recurring and persistent, large-scale patterns of pressure and circulation anomalies over important regions of the globe that correlate with climate at a site of interest. The Niño 3.4 region is often used to correlate SST anomalies with precipitation and temperature anomalies in the Continental United States. From August–December the Ocean Niño Index value was greater than 1.5 in this region (fig. 1). Fig. 1. The time evolution of the SST anomaly in the Niño region 3.4 in 2015. From August–December the Ocean Niño Index value was greater than 1.5. Source: CPC El Niño Diagnostic Discussion Slide Deck released on December 7. What does that mean for California? In general, during a strong El Niño with an Ocean Niño Index value greater than 1.5, California experiences a wetter than normal winter. During six strong El Niño events (1957–58, 1965–66, 1972–73, 1982–83, 1991–93 and 1997–98), California received 120 to 160 percent of normal precipitation from October through March (Pathak and Solis 2015). “However, examination of the historical record during these six years indicates that such a relationship has been limited to the south coastal region of California,” Anderson explains. Northern California could see wet, dry, or near average conditions (fig 2). Nevertheless, as the 2015 fall season played out, the El Niño event continued to strengthen with the SST anomaly passing 2°C and, in some locations in the tropical Pacific, 3°C. “Only two of the six strong events reached this level of anomaly —1983 and 1998 — which were both wet years,” says Anderson. Thus Water Year 2016 could bring a wet winter for the entire state. Fig. 2. 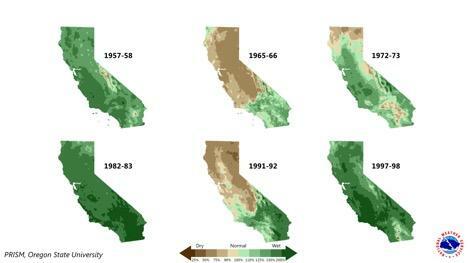 Precipitation in California in six water years with El Niño events and an Ocean Niño Index value greater than 1.5. Source: Sacramento office of the National Weather Service. Anderson stipulates that the stronger signal of above average precipitation conditions likely wouldn’t be seen until after the New Year, much like Water Year 1998. This prediction is based on consultations with the seasonal forecasting research community and indications from model studies. Nursery growers should be preparing now for these potential flooding conditions (fig. 3). Fig. 3. 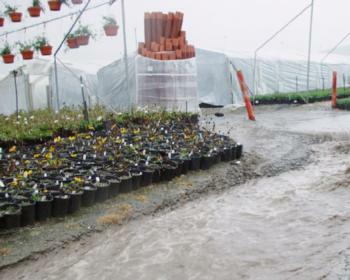 Nursery growers need to prepare now for potential flooding conditions that climatologists predict will occur in the upcoming months during winter storms. Photo: D.L. Haver. “So far, this water year has started slowly with accumulations trailing average. However, storms have been crossing over California with semi-regular accumulations of precipitation and snowpack. It is anticipated that this pattern will continue with accumulations improving and passing the average trajectory over the next few months. If the year plays out as expected, there is opportunity to mitigate the impacts of the ongoing drought, including improving surface reservoir storage and developing an above average snowpack to support spring and summer water use,” says Anderson. Another impact associated with El Niño events are elevated sea levels. These sea level anomalies along the California Coast are tracked by the California Nevada Applications Program (CNAP) (http://cnap.ucsd.edu/sealevel/). Julie Newman is Emeritus Floriculture and Nursery Crops Advisor, UC Cooperative Extension, Ventura and Santa Barbara counties and Steve Tjosvold is Environmental Horticulture Advisor, UC Cooperative Extension, Santa Cruz and Monterey counties. California Institute of Water Resources. El Niño and flooding resources. Pathak T, Solis SS. 2015. El Niño expected to drench California. UCANR Blogpost, Thursday, November 19, 2015. http://ucanr.edu/?blogpost=19574&blogasset=81020. Western Regional Climate Center. 2015. Will El Niño Make a Difference?